READING, Pa. - Albright's Daniel Sobolewski must have been thinking about the adage that you only have one opportunity to make a first impression when he took the field for his initial field goal attempt in a Lions uniform. He left more than a good first impression, he left a great first impression. The Lions were hosting Stevenson in the second game of the 2012 season. The Mustangs had just taken a 22-19 lead with 41 seconds remaining in the game, which appeared to spell defeat for Albright. Albright quarterback TJ Luddy drove the Lions 38 yards to the Stevenson 30-yard line to set up a potential game-tying field goal with three seconds left on the clock. Sobolewski calmly drilled a 47-yarder to send the game into overtime, which the Lions eventually won 29-22. "I was fine going on the field and then Stevenson called a timeout to ice me and I was thinking I've never had a kick like this before. Adam Galczynski was the holder and he was one of the better leaders on our team and he calmed me down and told me to just kick it like I kick it and it will go in. And it did. "It's been my favorite field goal because of the situation in the game and because it was my first field goal." Not only did Sobolewski force overtime with his kick, he also tied the school record with his 47-yard boot. Since that time, Sobolewski has improved every season and ranks as the premiere kicker in the Middle Atlantic Conference if not the country. From the very first time that Daniel Sobolewski kicked a football people took notice. It was the fall of his senior year at Linden High School in New Jersey and Sobolewski was outside during gym class when one of his friends coaxed him into kicking a football. Fortunately for him, one of the school's assistant football coaches was the teacher. After watching Sobolewski kick, he encouraged him to play football which he had never done on an organized level. Sobolewski was a soccer player, but one week before the start of football season he made the switch. "I knew I always had a good leg because of soccer, but it never crossed my mind to kick a football." That was the beginning of a process that eventually landed him at Albright. "I only had two schools look at me. Albright and Muhlenberg were the only two schools that showed me any interest. One of the big things that sold me on coming to Albright was the family aspect. It's a close knit family. I love the coaches and love the facilities." He cites his choice to attend Albright as one of the best decisions he has ever made. "I wouldn't change this for the world. I think coming to Albright and playing football is one of the greatest decisions I have ever made. From the people that I've met and things we have accomplished it's been great. Coach Marzka wants playing football at Albright to be the most positive and influential thing that you do in college and it definitely has been for me. The family that I've developed here will be with me forever." Numbers don't always tell the whole story, but in this case they do. There have been five successful 50-plus yard field goals made in the Middle Atlantic Conference in the last four years. Sobolewski is the owner of all of them. During Sobolewski's tenure at Albright the second-longest successful field goal in the conference is 44 yards, which occurred during the 2012 and 2013 seasons. Sobolewski has nine field goals of at least 44 yards during his career. Sobolewski has 21 touchbacks on his kickoffs in 2015, while the rest of the conference has a combined nine. He is averaging 62.7 yards per kickoff, which is nearly 10 yards better than his nearest conference competitor. And for good measure, Sobolewski is also leading the conference in punting averaging 42.9 yards per kick. He has six punts over 50 yards this season, while the rest of the league has a combined 10. It would be a vast understatement to say that Albright has a weapon like no other in the Middle Atlantic Conference. He makes opponents try and drive 80 yards for a touchdown on almost half of their drives and he continually flips the field for the Lions in the field position battle. And then there are the records. Sobolewski is the holder of several school records including the longest field goal and career field goals made and career points scored. His field goal against FDU-Florham along with his nine points scored against the Devils broke the career records in each category. He now has 45 career field goals and 464 career points, which topped the previous school records held by Dennis Unger. 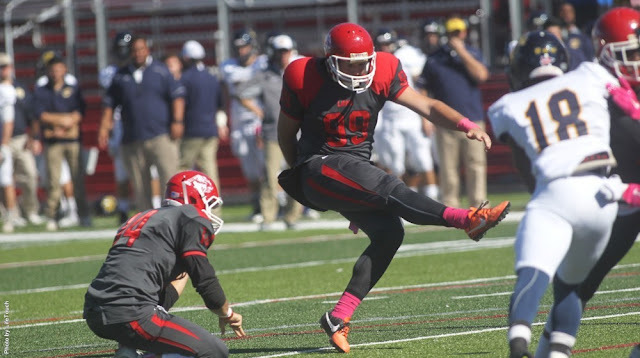 Sobolewski also connected on a pair of 52-yard field goals last season, which stands as the Albright record. He made a 52-yarder against King's and also connected from 52 yards against Misericordia. But Sobolewski is not one to focus on the awards and accolades. "It's really nice to be honored and recognized, but I don't focus on those things. I have to stay focused on the task at hand, which is trying to get better every week and to help lead this team to a championship." He should have ample time to look back on his Albright career and note his achievements because he has etched his name in Lions history with records that could stand for quite some time.